Whenever I bake, I try to remember to check that I have all of the ingredients before I start; there have been many times when I’ve had to knock on my neighbour’s door to borrow some white sugar, oil or milk, and other times when I’ve had to send Skipper to No Frills to pick up a missing item. I haven’t had this problem in almost a year. Last month, though, a new one surfaced. I was half way through mixing the ingredients to these Oatmeal-Banana Muffins when I stopped cold. “Just how many muffins does this make anyway?” I wondered. 24. “Ugh! I only have one muffin pan. Fortunately, I also had one for mini-muffins, the size that is perfect for little people’s lunch bags, and that solved the problem in no time. 1. In a bowl, combine oats and milk. Set aside. 2. In another bowl, combine flour, sugars, baking soda, salt, cinnamon and nutmeg. 3. Add butter, eggs, and bananas to the oatmeal mixture. Stir until thoroughly combined. Add mixture to dry ingredients; stir until moistened. Stir in chocolate chips. 4. Spoon batter into muffin cups, filling about 3/4’s full. (Hint: use an ice cream scoop for less clean-up.) 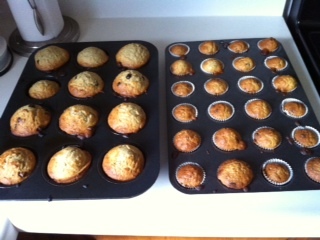 Bake in a preheated oven for 20 minutes or until muffins are firm to the touch. These went over well with my hard-to-please, picky-eater family. My non-picky eating friends like the mini-muffins, which we now call “muffin pops”. Previous Previous post: The Downtown Dash: Hot, hot, hot!